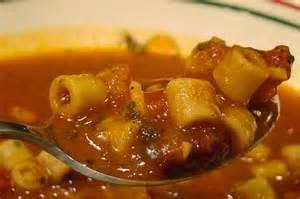 There is nothing more warming at this time of year than a bowl of piping hot home-made soup. It beats all those packets and cans of soups stacking the supermarket aisles and it is better for you, containing fresh wholesome ingredients. 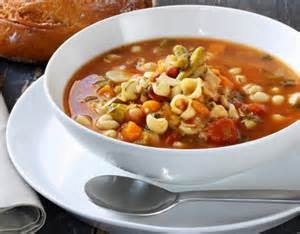 This Minestrone recipe is quick and easy to make and the whole family will love it so much they won't want packet or canned soup ever again. Heat the oil in a large saucepan and add the garlic and onion. Fry for 3 minutes, stirring all the time until soft but not brown. 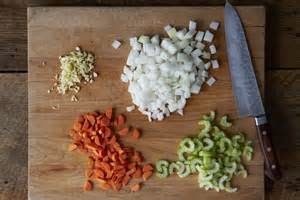 Add the bacon, carrots, leeks and chopped tomatoes to the pan and cook over a medium heat for 10 minutes, stirring now and then, until the vegetables are soft. Add the tomato puree and herbs and stir well. Slowly stir in the beef stock and pasta shapes. Add a good dash of salt and pepper.Bring to the boil, lower the heat and simmer for 20 minutes.